Every item in our collection is crafted with practicality and longevity in mind. Here are some tips to keep your articles as long-lasting and beautiful as they are meant to be. 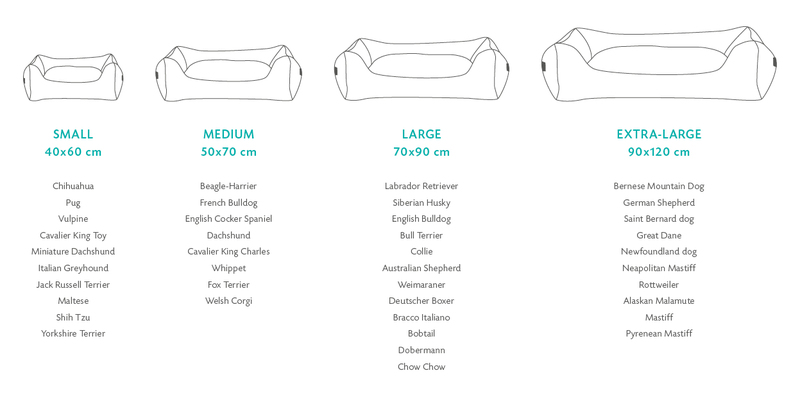 This size chart helps you find the right bed or cushion size for your dog. We also recommend to refer to the specific item measurements provided in each product’s description. Made of 100% cotton fibres, 2.8’s canvas is soft to the touch and yet incredibly resistant: your dog will enjoy maximum comfort and you will be stress-free when it comes to maintaining it. 2.8’s cotton products come in an elegant palette of five nuances. All our colours are dyed with environmentally-sustainable processes, in order to respect the health of our dogs as well as our planet’s. This textile is machine washable at cold temperatures (30°C). Do not spin-dry. Jute is a 100% biodegradable and recyclable material, with a very high breaking strength and low extensibility. Its best feature is a beautiful feel, unrefined and bristly to the touch, really pleasing to the eye. Jute also guarantees a very good breathability: it is a fresh fabric, perfect for your dog’s comfort even in the hottest months of the year. 2.8 has chosen TACS for its Casentino wool, a legendary fabric dating back to the Tuscan Renaissance. Manufactured in the hills over Arezzo, this water-resistant textile reflects its homeland’s vibrant and warm colours. Its unique ‘peeling’ feel is perfect for furnishing warm interiors and for the dog’s own tactile experience. Eco-friendly meets history to weave military wool. Wool blankets collected and recycled from several armies around the world are sanitized and turned into a great fabric that is as elegant as it is unique: these cloths carry their original embroidery, making each article one of a kind. Found in tree trunks, cotton seeds and hemp grass, cellulose fibre is nature’s own weft. With a very low impact on the environment, it’s a great material to use for dog-friendly and human-approved accessories. For daily maintenance, clean with a damp wipe. Cavallino is a pony skin-looking cowhide tanned in Italy in accordance with EEC standards. 2.8 has also committed to select only calf leather that follows the rules of CITES Convention and is tanned without the use of cetacean oil. For a deeper cleaning, we recommend to bring this textile to laundry services specialised in leather and fur. Perfectly light yet highly absorbing, honeycomb cotton dries very quickly and it’s extremely durable. Like most cotton textiles, it’s machine washable and preserves its softness even after many washes. Made from Italian cotton, terry cloth is the best choice when it comes to designing summer articles. Like most cotton textiles, it’s machine washable and preserves its softness even after many washes.